In the industrialized world, it is widely accepted that a free market leads to greater efficiency in terms of productivity and cost. But how can competition be introduced into situations where for example alternative suppliers cannot be used? Benchmarking provides an effective substitute for competition. 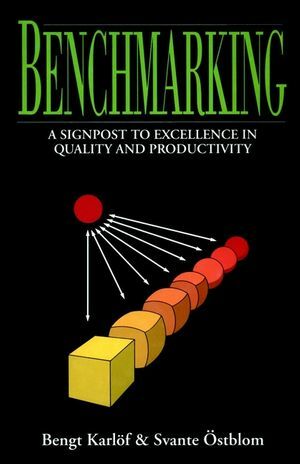 Benchmarking is a continuous, systematic process for comparing your own efficiency in terms of productivity, quality and practices with those companies and organizations that represent excellence. It has been demonstrated to have a profound effect in numerous situations where conditions of a 'planned economy' exist. 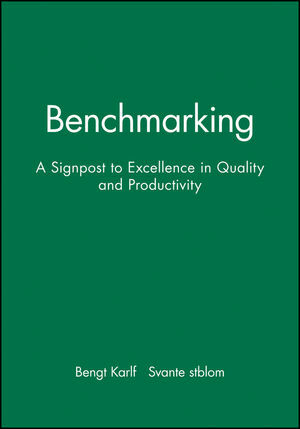 This is a must have book for any organization embarking on the Benchmarking process. Bengt Karlof is the senior partner and president of Karlof and Partners Consultancy, a Swedish-based strategy consultancy with worldwide interests. Renowned for his work in the area of strategic development, Bengt Karlof has acted as a consultant for numerous major organizations in both the public and private sectors over the past ten years. He lectures widely in both academic institutions and at management seminars on all aspects of strategy. He has written a number of books on the subject which have been translated into several languages. Always from a practical stance, Bengt Karlof's aim is to produce a business strategy which will make organizations work more efficiently. Aspects and Categories of Benchmarking. Stage 1: Decide What to Benchmark. Stage 2: Identify Benchmarking Partners. Stage 5: Implement for Effect.